This week is another Free Spins week at Juicy Stakes Casino. The casino is giving up to 100 free spins when players make a deposit. March 18 – 23, they’ll get some extra fun for their money as they check out popular games they may have missed in the casino’s growing collection of slots from Betsoft. 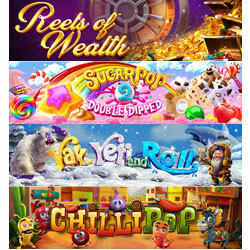 Today until Saturday, players get free spins on four of Betsoft’s best and newest: Chilli Pop, Yak Yeti & Roll, Reels of Wealth and Sugar Pop 2 – Double Dipped. Chillipop is a sizzling-hot Mexican fiesta. Players mix up a spicy salsa by matching symbols like tomatoes, onions, garlic, and peppers to create the tastiest (and top-paying) combinations. Surrounding players in gold and jewels, Reels of Wealth inspires players to win big. Wannabe billionaires can earn the payday of a lifetime with this game’s innovative new Megastar Jackpot mini game. The new Sugar Pop 2 – Double Dipped has a Jelly Bean Cannon and a Morphing Golden Wild candy that shifts and changes shape to match any candy near it. Players from around the world enjoy playing poker, slots and table games at Juicy Stakes Casino.